﻿ Tongyeong Anchovy Tourist Hotel, Tongyeong-si | FROM $45 - SAVE ON AGODA! "We had a lovely time at this hotel." Have a question for Tongyeong Anchovy Tourist Hotel? "Staff were very accomadating and very helpful when we asked about ferry times!" "Hotel staff were friendly and helpful." "The room was very spacious and the beds very comfortable." 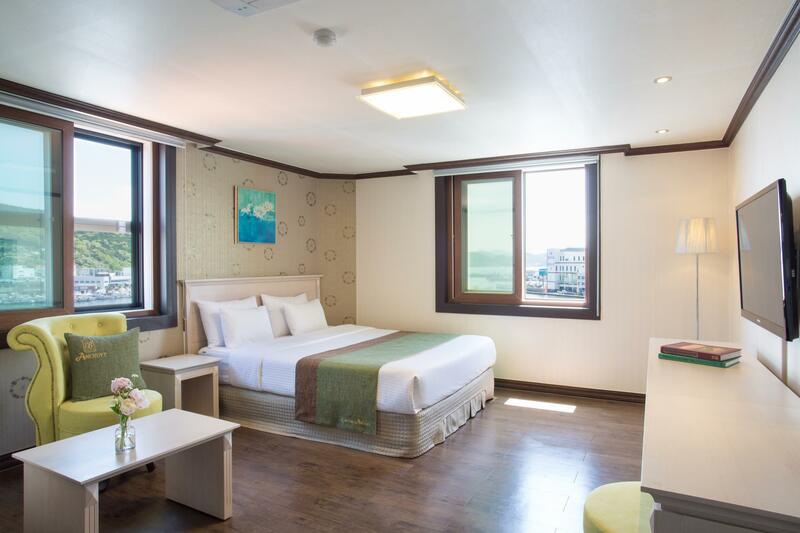 If what you're looking for is a conveniently located hotel in Tongyeong-si, look no further than Benikea Anchovy Hotel. From here, guests can enjoy easy access to all that the lively city has to offer. With its convenient location, the hotel offers easy access to the city's must-see destinations. Benikea Anchovy Hotel offers impeccable service and all the essential amenities to invigorate travelers. A selection of top-class facilities such as free Wi-Fi in all rooms, luggage storage, Wi-Fi in public areas, car park, restaurant can be enjoyed at the hotel. All guest accommodations feature thoughtful amenities to ensure an unparalleled sense of comfort. Besides, the hotel's host of recreational offerings ensures you have plenty to do during your stay. 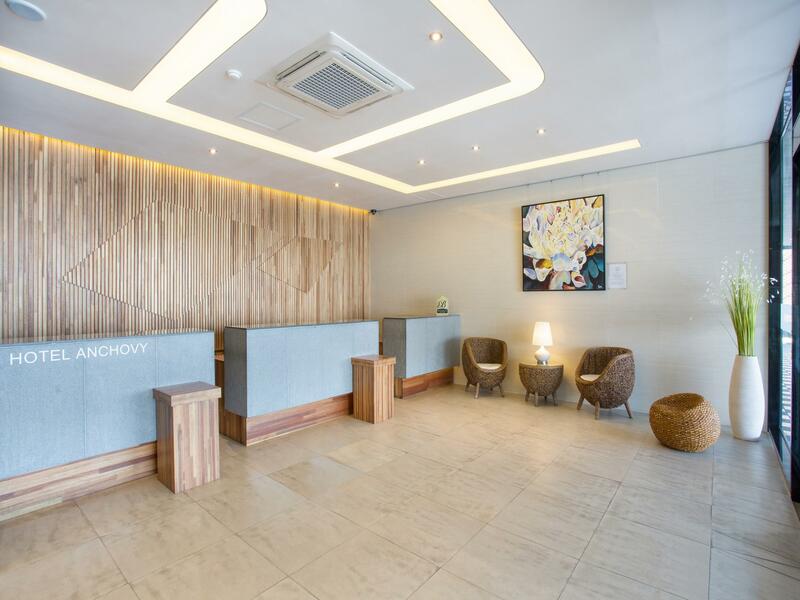 Discover an engaging blend of professional service and a wide array of features at Benikea Anchovy Hotel. "This hotel is in a good location." hotel itself is fine, just the cafe serving breakfast which have to prebook or they will only offer a set, it is very confusing on the menu coz whatever showed will be served after 9:30. on the menu, a salad served with a drink labelled as a set cost kw6000 is really inexpensive, funny thing is even a brunch set cost at kw12000(was @9900 during my visit), they asked for kw10000 for the breakfast set with a roll or toast togwether with tiny portion of salad plus a drink. front desk with staff can communicate with English but not other people. The staff were extremely helpful and accommodating, especially the front desk staff who helped with directions, phoned places for us and generally gave us so much information on what to do in the area. We will definitely book here again. My family like this hotel so much. We booked twin room with harbour view. It is very spacious and the room come with sofa. The bed is very comfortable. The only bad thing is no free breakfast. There is cafe at level 1 and the taste of the food is just nice. No complain about it. The location is quiet and it is very close to the small harbour. The fastest check-in I have experienced, I did not need to fill in any form or show my passport, on the other hand, you may think the security is low, believe it is "trust" between people. We got problem with our rent car, staff helped us to contact different parties such as car rental company and repair companies. They treated it very seriously, we appreciate their sincere follow-up very much. Restaurant food is good and price is reasonable, complimentary coffee. Free parking, free wifi in rooms. Very good. Two problem: the restaurant downstairs is fine but too expensive - 7 dollars for a sandwitch, 12 for an omlette. Secondly, the Agoda rate at the time of booking was higher than the one had I booked the same room a on Agoda website a day prior to arrival. Otherwisw, the staff was wxcellent, the harbor view from the window very nice, the entire experience very positive. They deserve a higher mark than the giver so far. We had an enjoyable stay at Benikea Anchovy Hotel. The room was very spacious and the beds very comfortable. Hotel staff were friendly and helpful. Location was perfect, facing the harbour and within walking distance to several tourist spots and the town market. Many eateries in the neighbourhood. This was our 3rd visit to South Korea and Benikea Anchovy Hotel is definitely one of the best hotel stays we had in the country. 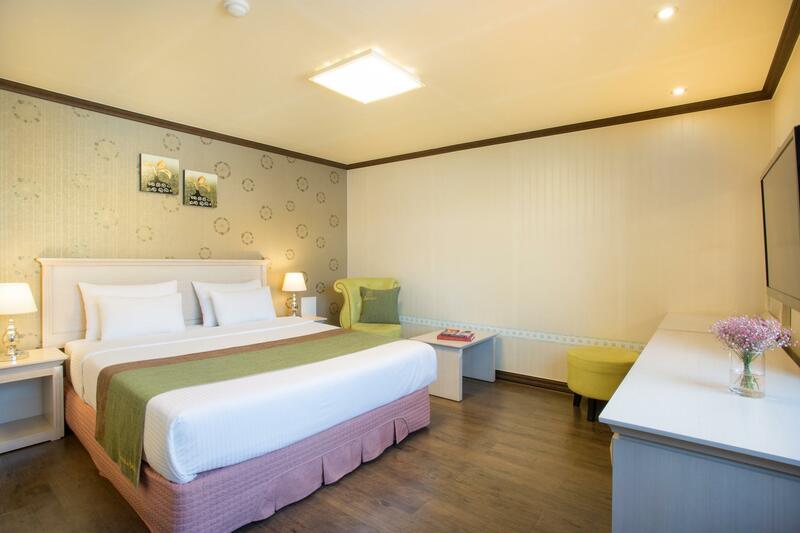 We highly recommend this hotel to those visiting Tongyeong. The room could have been a little cleaner (floor, surfaces), but we attirubuted it to being a busy season with full occupancy coming and going. The double sea view room is nice, and the stay was quiet. The location is easily accessible by bus and taxi and it was pleasant walking distance to nearby markets and restaurants. We had a free coffee ticket and used it for breakfast at Homestead before checking out, and it helped make for a perfect morning. I would definitely stay hear again for my next visit to Tongyeong though I hope to have more time in the neighboring islands. Great weekend getaway. About 7,000 won cab ride from bus terminal to hotel. Hotel can call cab for you at additional 1000 won to fare. Close to Dongpirang Wall Painting Village. Easy to get around via cab to Hallyeosudo Landscape cable car and Excursion Boat Terminal. Recommend boat trip to Hansando Island and Songdo Island. Overall, a great stay and a pleasant surprise. The staff couldn't have been nicer and the coffee bar on the first floor is always a good place to start the day. Clean rooms, a great shower and ( if you face that way ) a fabulous view of the harbor. It locates at work-fishing-village with nice harbour view. Silence at night time and busy in the early morning. Free parking is offered aside the hotel. There are many retaurants for seasonal seafood and meat BBQ at the zone. Neither night market nor pub is opened. Room is clean and large enough. No wardrop or sofa is offered but only 2 chairs are facilitated. It was a new, clean hotel and it was quite comfortable. It is located on the eastern harbor and we had a nice view of it from our room. We saw other hotels on the main harbor that did not look nearly as nice. There is a parking lot across from the hotel where we parked at no charge. We just drove over to the main harbor area and parked at a conveniently located lot near the traditional market. Free WiFi. There is a Homestead Coffee shop next to the lobby and we were given vouchers for two free cups of coffee from there but there was also a hot and cold water dispenser in the room. I would stay at this hotel again. It looked like the nicest hotel in Tongyeong. We had a lovely time at this hotel. Staff were very accomadating and very helpful when we asked about ferry times! Would definitely stay again! Overall we enjoyed our stay at the Anchovy and even received some dried anchovies as a free gift! Though I personally think the cost of staying at the hotel is a little expensive, especially considering there aren't any facilities. There is a coffee shop downstairs where you can purchase food and drinks, which was average. I have no complaints with regards to cleanliness and the staff as they were both excellent. It was okay but very tired - the one staff I saw was very friendly. The room was enormous but the shower rusted, fixed and just terrible. For the price I was expecting something a bit more... oh well the view was lovely. I arrived on Friday, Oct. 2, 2015. I did not take any shower, but, later, I saw some water on the floor of the loo (it was not a real bathroom) as there must have been a leakage from the W.C. bowl. When I went to bed I discovered that the mattress was covered by a white-cotton fitted bed sheet and that on this fitted bed sheet there was just a, very thin, artificial-fabric bed spread: nothing else, whereas there should have also been a quite normal, white-cotton bed sheet. I felt very uneasy and used a bathroom towel to replace the bed sheet. The situation got even worse around 4.00 a.m., as it was too cold, in the bedroom. I put on a pullover and spent some hours working on my computer. I went out at 7.30 a.m., I spoke to a new receptionist, and complained. I went to the tourist office, but, there, I discovered that they needed a reservation at least one day in advance. When I came back to the hotel, in the afternoon, the same receptionist I had seen in the morning said there was no way of helping me, as it was Saturday. Later on (there was also the first receptionist) he promised to give me a blanket and a bed sheet, at 7.00 p.m.. When I came back to the hotel I found my bedroom exactly as I had left it in the morning, I checked out on Sunday, Oct. 4. 2015.
l should said that the hotel is wonderful and comfort. Location is perfect.